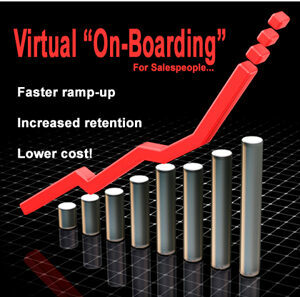 The Right Sales Call Cadence? How often must we remind our customers of the value we bring to the table? Is a once-per-year reminder sufficient? How about twice per year? Three times? Most people agree that, ideally, they’d like to remind their customers many more times; in fact, they say they’d like to keep a reminder of some sort in front of their customers as frequently as possible. 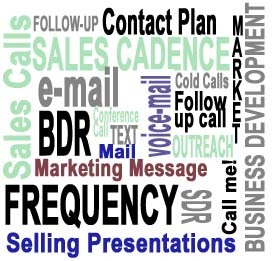 This conclusion leads to questions about the ideal sales call cadence or contact frequency, which are among the most frequently-asked by business development and sales people alike. We’re all concerned about coming across as too aggressive or, even worse, alienating customers or prospects by calling too often. Generally speaking, sales calls and marketing messages become “over-done” (i.e., too frequent) when they fail to provide value to the customer or prospect. This leads nicely to a better question: how can we develop and implement this value-added approach? Master the practice of pre-call planning. The most successful sales people plan their calls very carefully, based on research and record-keeping (i.e., effective use of a contact management or CRM system). Consequently, they are able to learn a great deal about their customers or prospects during each well-planned and well-executed call, and are able to use this information to make strategic decisions about the frequency and content of future contacts, often using the written pre-call plan as a post-call review tool. In addition, these “better” sales calls do not go unnoticed – and because of them, customers or prospects are more willing to schedule follow-up interactions. Questions are the answer. Most of us tend to plan sales calls or presentations by listing our “speaking points” (the things we plan to say). But it’s better to put an equal amount of focus and thought into the things we will ask. Asking the right questions is how we learn about our customers’ needs, interests, priorities and challenges; it is how we determine what to do and say next; it is how we build and solidify true selling relationships. As a rule-of-thumb, try to craft questions that focus on what people are trying to accomplish rather than on what they “think they need.” In addition, a frequent by-product of asking good questions is enhanced listening capacity, as our buyers will be talking more as they answer our more frequent questions. It’s much easier to listen if we stop talking! Develop a proactive style. This simply means that we end each interaction by suggesting a consequential next step, preferably one in which we take the proactive position. This helps in several ways.